It’s gull chick season again. 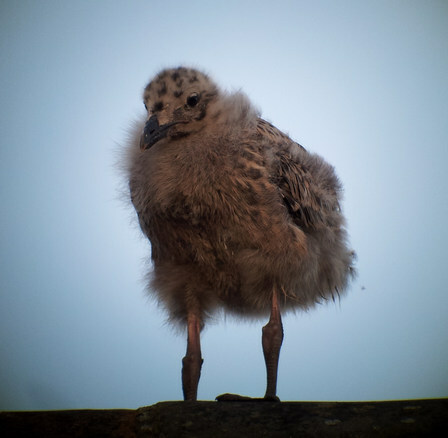 Crail gets filled with initially cute and fluffy gull chicks on every other rooftop, that then change into less attractive, half-feathered and noisy young gulls. This transition is accompanied by a change in position from chimney top down where they can be easily ignored down to front garden where they are more obvious. The gull chicks have a shrill insistent whining for food so as they stride around on the ground they appear abandoned. I often get calls at this time of year from people worried about them being abandoned and helpless at this stage. It’s true they are better off on the rooftops where cats, dogs, people and particularly cars aren’t a problem, but from the parent gull’s point of view they expect their chicks to wander about a bit and they can find and feed them easily in a quiet moment wherever they are. So the best thing to do is to leave them be, or possibly shoo them to a nearby place of relative safety away from the road. I had a gull chick walking along the gable of my roof last night. Sooner or later it will take a tumble down into the garden and then we will have to periodically discourage it from wandering out to join the crowds and the cars.